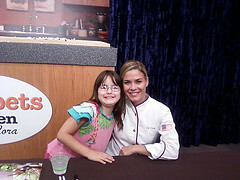 I was thrilled to attend an event with my favorite Iron Chef Cat Cora, cooking with the Muppets (no surprise here; the Muppet Show was my favorite growing up!) to promote DisneyFamily's Muppets Kitchen. Cora and her cohorts were so funny, entertaining, and full of great ideas for dealing with dinner, school lunches, and ensuring that our kids eat healthy. 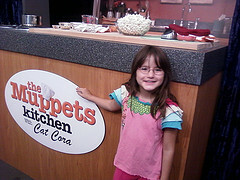 We tweeted during the event, using the hashtag #MuppetsKitchen. Cora answered questions on how to get kids to try new foods (just try one bite, and then try again the next day and the next) and sneaking vegetables into their meals. I loved the way she approached that one in particular: go ahead and puree the hidden vegetables, but then make it a guessing game while you're eating. This way, they get the lessons on how to make sure they get what they need, and may find that those "sneaky" vegetables aren't so scary after all. We were lucky enough to get to try some of the recipes available at the Muppets Kitchen, including trail mix popcorn (yum) and mini Greek burgers (very yum). We also got Cat Cora's latest book, Cat Cora's Classics with a Twist signed by my favorite Iron Chef, a mixing bowl that is almost too large for my kitchen, an apron, a bracelet with my favorite Muppets character, Animal, and...The Muppet Show The Complete Second Season! I'm so glad that my girls are loving it (almost) as much I do! Riley and I enjoyed time together in the kitchen this past summer, and this event reminded me how important it is to make time in the school year, too. Eating is a lifelong activity and I would love for her to have more skills in the kitchen than I did when I was first on my own. And let's face it, it's a lot easier to face recipes if there are Muppets involved. *Disclosure: the post states what I was given for free. I was not compensated to write this post, and the opinions expressed are completely my own. Call it pathetic, but true: I do love the Muppets that much. Oh, and the link to Cat Cora's cookbook is affiliated with my Amazon account. If you buy the book through that link, it will generate a small fee for me. Not nearly enough to put Riley through college or anything. Oh wow, April! That just sounds like SO much fun! Where do you hear about these events at? I would have loved this!